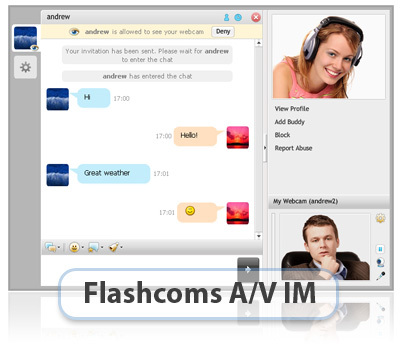 Flashcoms video chat and messenger are part of Audio/Video Chatting package module. Place your order in the Dating Pro Marketplace or contact us in live chat. It is a feature-rich, award winning, turnkey flash chat application that enables real-time text/audio/video communication for your web site users. Cutting-edge functionality, full integration with existing users’ database, handy plugins (whiteboard, IM gateway, online games, MP3 player), advanced administration and moderation make Community chat the ideal solution for dating, community, entertainment and social networking web sites. 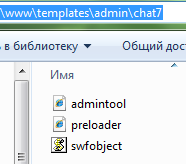 -Login and DB integration – Cross-platform chat solution, no software installation required! -Integrated friends / block list – Impeccable video / audio quality with adjustable settings. -And MUCH more to discover! It is a flash based, cross-platform solution for one-on-one on-site communication. Apart from text messaging it supports video/audio streaming, includes online games, file/image sharing, handwriting and many more features. As all Flashcoms products, Community messenger can be easily integrated with your web site users’ database and skinned to match your site look and feel. RTMP address: this field will depend upon Media server option that you choose. RTMP address stands for IP or domain name of the server where FMS, Wowza or RED5 is installed. 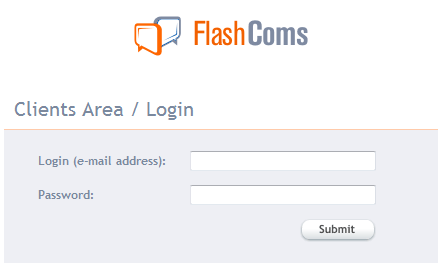 You can either have a dedicated media server of your own, or you can use the FMS hosting service provided by FlashComs. Server details can thus be obtained from hosting provider or from FlashComs (http://www.flashcoms.com/services/hosting/). 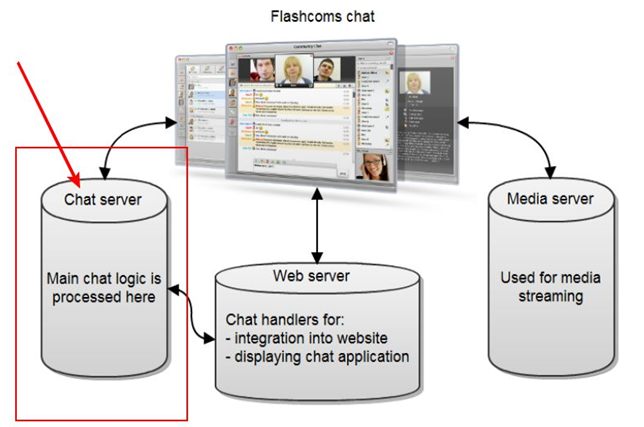 Note: Flashcoms developers recommend installing the chat server where the media server is installed. Note 2: Activation procedure is similar for both Community Chat and Site Messenger. Please note that they are two different products. You can order them here: http://www.flashcoms.com/products/community_video_chat/pricing/ and here: http://www.flashcoms.com/products/site_messenger/pricing/ . No other settings are required here. 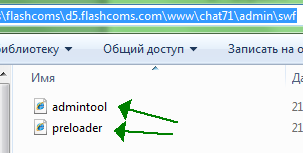 Please note: when you enter your chat or messenger admin panel, default administrator login/password are admin/admin. Make sure that you change the password once you entered admin console for the first time for better security. Why pay extra for the setup? Every chat generates a lot of traffic (audio/video stream). It needs to be hosted on a media server, either your own (you will likely need a dedicated server) or on the server provided by Flashcoms company (FMS hosting service). It is not possible to host a chat on a shared hosting account, because the load will be too high, and there is not enough bandwidth and other characteristics on a shared hosting account. What’ is the advantage of being hosted with you? Going hosted solution path all application files will still reside on your website but video / audio stream will go over our FMS without bringing any extra load on your side. 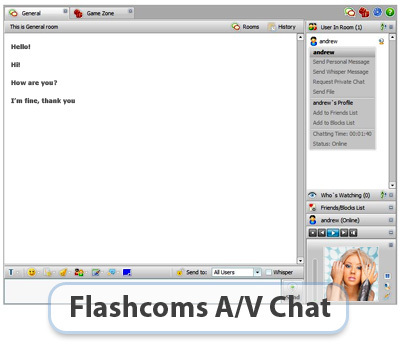 Flashcoms Community Chat and Site Messenger as part of Audio/video chatting package are basically devices that you need to purchase extra activation packages for, from Flashcoms. It specifies the amount of users who can simultaneously use your chat. Each Software package purchased under this Agreement is licensed for one domain name only. The license cannot be transferred to another domain. If you would like to run the Software on multiple domains you must purchase a separate license for each domain. You may not distribute copies of the Software or any accompanying written materials to others, in an altered or original state.